We wish all our clients, consultants, friends and collaborators a very happy holiday season and we look forward to seeing you in 2018. Our office will close on the 22nd of December and will reopen on the 15th of January 2018. Our residence at Huntleys Cove is nearly completion now that the cedar cladding has been installed and painted, with the clients expected to move in before the end of the year. We are working on finishing touches to the joinery and the project will be complete once the carpet is laid in the bedrooms. The Drummoyne apartments are progressing on track for completion in late 2018. We have recently finished pouring the two underground carpark levels and the slab at ground level – the biggest slab of the project. We are looking forward to completing the upper two floors in the new year. The project includes post-tensioned slabs to achieve maximum spans with minimal supports. We are looking forward to be starting a new house in Russell Lea at the beginning of next year. The two storey residence is designed by our long time collaborator, Mark Szczerbicki Design Studio, and consists of a detailed face brick ground floor to tie in with the existing street and a contemporary lightweight first floor. The house will feature a swimming pool with a glass wall, and has been designed to comply with new BASIX energy efficiency targets. Ferrocon has recently completed major alterations and additions to Chiswick Residence. 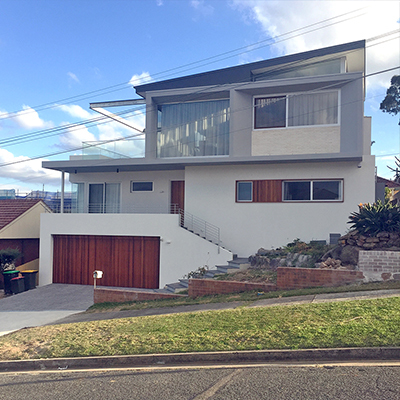 The renovation included a new facade, extensive steel structure for a new upper storey, substantial shifts in plan of the existing house, and the addition of various new bathrooms and joinery. The clients have since moved in and are looking forward to adding landscape. Ferrocon has completed the fitout for Two Fratelli Café at the end of Jones Bay Wharf in just under three weeks. The project, designed by Mark Szczerbicki Design Studio, envisioned the industrial character to be brought back to the forefront, while accents of blue and bronze bring a warmth to the interior space. The internal layout was simplified to create better flow and access throughout the café. The venue is fully licensed and caters for parties and events. The Huntleys Cove House is progressing well, with most of the Dincel structure completed on site. The formwork has been set up for the top garage level and will be poured soon. Killara House (designed by Studio [R] in collaboration with Mark Szczerbicki Design Studio) has won a High Commendation at the 2017 Ku-Ring-Gai Council Architecture and Urban Design Awards in the Dwelling House category. We congratulate all the shortlisted and award-winning projects this year. Ferrocon has completed an iconic project in the centre of Five Dock’s commercial precinct. The building comprises of two levels of commercial space with full height frameless glass doors on each level and cantilevered concrete floors. We are looking forward to seeing the new tenants move in. Construction has started for our new apartment residential project consisting of 9 waterfront units in Drummoyne. A large amount of excavation has commenced. Most apartments will have spectacular north-facing views of the Parramatta River and Gladesville Bridge. We are proud to announce that our Russell Lea House has been shortlisted for the 2016 IDEA Awards alongside some fantastic projects for this year’s IDEA Awards. Photos of the house can be viewed in the RESIDENTIAL section. Congratulations to all the shortlisted entries throughout the categories and we look forward to hearing the winners being announced in November. Our new residential project in Huntleys Cove has started on site. The two level residence is located on a steeply sloping site with a garage at street level and two-storeys below which open up to a pool at ground level. Designed by Mark Szczerbicki Design Studio, the house will be constructed using Dincel technology for the concrete slab and walls, with extensive landscaping tying the project with its bushland setting. A new residential project with panoramic bay views has recently commenced construction in Chiswick. The masonry and concrete construction of the garage and ground floor anchors the house and contrasts with the lightweight top floor roof and main entertaining area. We are working with Mark Szczerbicki Design Studio on the project and we are expecting completion in mid 2017. Our latest new house project in Russell Lea is now complete. The clients have happily moved into their new house. More photos by Tom Ferguson can be viewed in the RESIDENTIAL section of our website. Our commercial project in Five Dock is progressing well. Pictured is the interior of a specially engineered glass lift running centrally through the building. We are expecting the project to finish towards the end of the year. Ferrocon have completed the construction of a residence in Killara, involving restoration and a new extension to an existing home, with an addition of an unassuming low-slung living pavilion at the rear. The centre of the new expansive space remains column-free as a result of a large custom-made steel truss supporting the stacking sliding doors and roof. The residence was designed by Sam Rigoli and Studio [R] Architecture & Design in collaboration with Mark Szczerbicki Design Studio, and with landscape by Amber Road Design. More photos by Tom Ferguson can be found in the RESIDENTIAL section of our website. Ferrocon have completed extensive alterations and additions to an existing Californian bungalow in Rodd Point. The alterations include substantial shifts in plan where the bedrooms were moved to the front of the house, allowing the rear of the house to open up to the backyard for a more flexible plan. More photos of the project by Tom Ferguson can be found in our RESIDENTIAL section. An article featuring the house was featured in House and Garden Magazine and can be found in the RESIDENTIAL section of our website. Ferrocon are pleased to announce that we are sponsors for the independent cross university program, Urban Islands. As part of the sponsorship, Urban Islands 2016 have curated an exhibition consisting of works from the past 10 years of the program. The exhibition will be held at the University of Sydney Tin Sheds Gallery and will be open between June 9th – July 15th 2016. Construction has started on our new residential project in Russell Lea. The 2-storey residence will include a 3-car garage and home theatre at ground level, with bedrooms and an open-plan living area on the first floor. The house was designed by Mark Szczerbicki Design Studio. We are expecting completion in mid 2015. We have just completed a fitout for The Pigeonhole - a new cafe in Ultimo. The project was designed by Perumal Pedavoli Architects, and involved stripping back the existing sapce to its bare structure and installing a detailed industrial-style interior. We highly recommend the great coffee - drop in if you're in the area - the cafe is at 458 Wattle St, Ultimo.